10:10 pm--FROM FOLIO 29, Mr. Bjork, interviewed on 11/1/75, reports letting his dog out at this time. 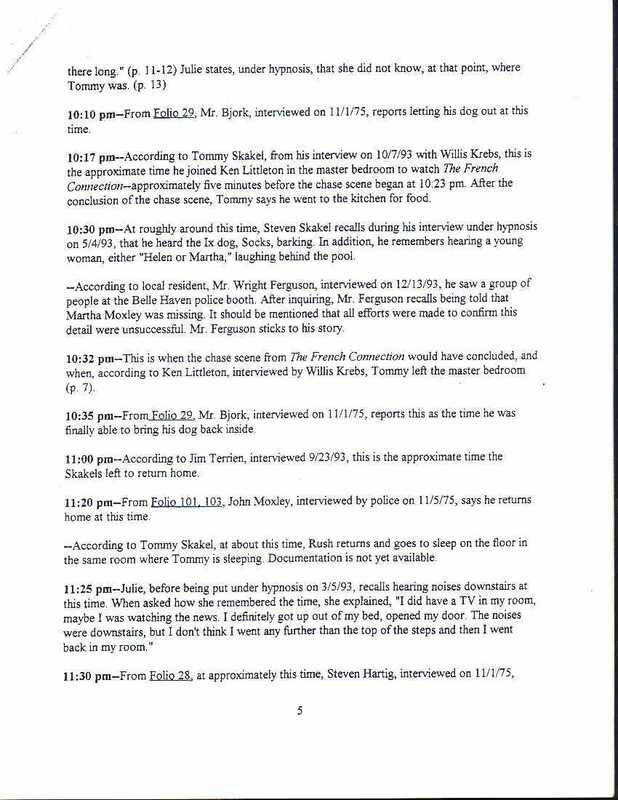 10:17 pm-- According to Tommy Skakel, from his interview on 10/7/93 [footnote 1] with Willis Krebs, this is the approximate time he joined Ken Littleton in the master bedroom to watch The French Connection -- approximately five minutes before the chase scene began at 10:23 pm. After the conclusion of the chase scene, Tommy said he went to the kitchen for food. 10:30 pm--At roughly around this time, Steven [Stephen] Skakel recalls during his interview under hypnosis on 5/4/93, that he heard the Ix dog, Socks [Zock], barking. In addition, he remembers hearing a young woman, either "Helen or Martha," laughing behind the pool. --According to a local resident, Mr. Wright Ferguson, interviewed on 12/13/93, he saw a group of people at the Belle Haven police booth. After inquiring, Mr. Ferguson recalls being told that Martha Moxley was missing. It should be mentioned that all efforts to confirm this detail were unsuccessful. Mr. Ferguson sticks to his story. 10:35 pm--FROM FOLIO 29, Mr. Bjork, interviewed on 11/1/75, reports this as the time he was finally able to bring his dog back inside. 11:00 pm--According to Jim Terrien, interviewed 9/23/93, this is the approximate time the Skakels left to return home. 11:20 pm--FROM FOLIO 101, 103, John Moxley, interviewed by police on 11/5/75, says he returned home at this time. --According to Tommy Skakel, at about this time Rush returns and goes to sleep on the floor in the same room where Tommy is sleeping. Documentation is not yet available. 11:25 pm--Julie, before being put under hypnosis on 3/5/93, recalls hearing noises downstairs at this time. When asked how she remembered the time, she explained, "I did have a TV in my room, maybe I was watching the news. I definitely got up out of my bed, opened my door. The noises were downstairs, but I don't think I went any further than the top of the steps and then I went back in my room."